We offer a lot of wonderful products with which you can display your new images: prints, fine art framed prints, canvas blocks, framed canvas, mini-accordion albums, framed metal prints – for a more modern look, and our new slate stone photo displays. Our framed canvas gallery wraps are set apart from regular canvas wraps by the handcrafted solid wood floating frames that turn the canvas into an art piece you’ll want to hang on your wall. You can see all the frame choices by clicking here. A canvas is nice, but a framed canvas is finished and complete. 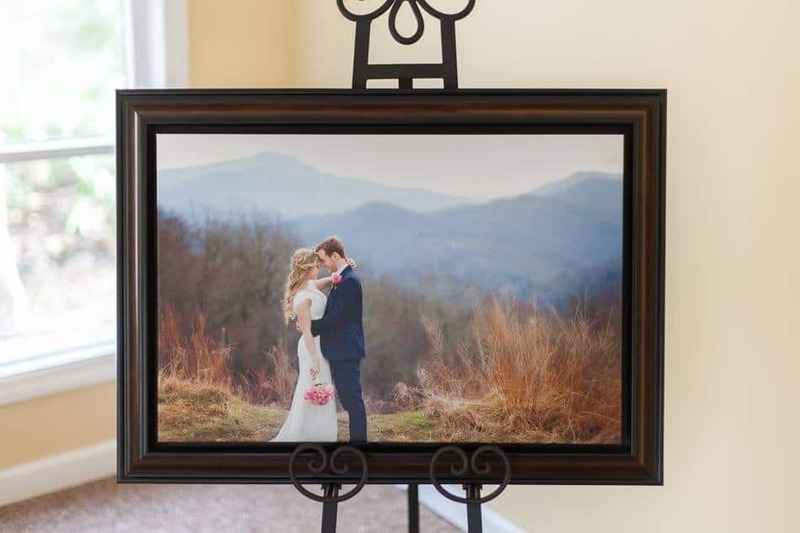 The framed canvas is a popular choice with our wedding and portrait clients. EVEN BETTER than a framed canvas is a PAINTED PORTRAIT! 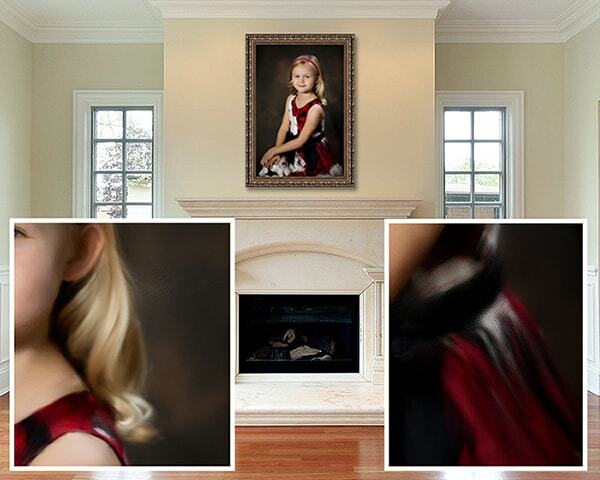 These digitally painted portraits make a beautiful display piece in your home. Indoor or outdoor portraits can be turned in to a painted portrait. A new product, that is also VERY popular, is our photo slate. 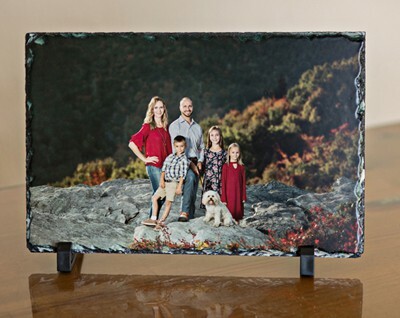 It is a photo printed on a piece of slate stone – and truly, it’s simply stunning. Due to irregularities in the surface and edges of the stone, each print on slate is unique, adding to this product’s charm. They are available in three sizes: 5.5″x5.5″ Square, 5.5″x7.5″ Rectangle, and 7.5″x11.5″ Large Rectangle. 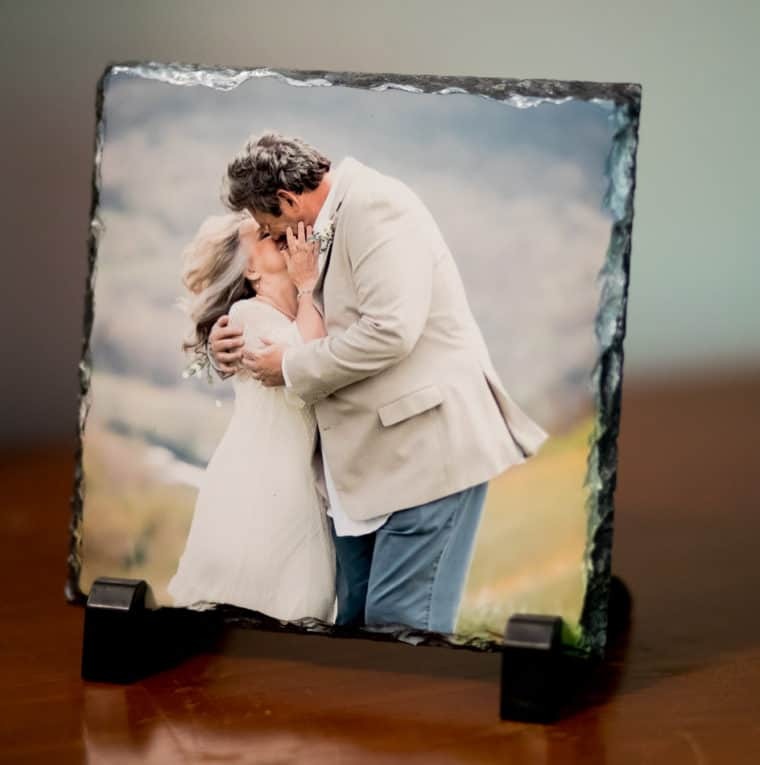 The photo slate comes with a stand (pictured), turning it into a stunning display piece that will look great on any mantle or desk! Photo slates make great gifts, too! These custom lighted wine bottles are just beautiful and a wonderful display choice for wine-lovers or those who had their portraits or wedding take place at a winery or vineyard! 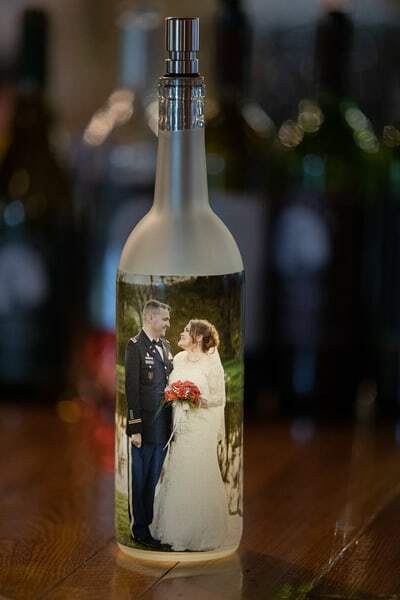 You can display any image – and it is printed beautifully and back-lit on a frosted glass wine bottle. The lighted bottle insert is a battery-powered, LED stick that is controlled by 2 included AA batteries. The lighted insert is adjustable with two brightness levels from the turn knob on top. Looking to experiment with different colors? The insert is waterproof! Trying filling the bottle with water and a bit of food coloring to get a different back-lit tint (keep in mind, the brightness could diminish significantly as the water gets darker).